A bizarre new Middle East is taking shape. We are now witnessing the disintegration of two countries and the rise of one ruthless caliphate. Part 1. 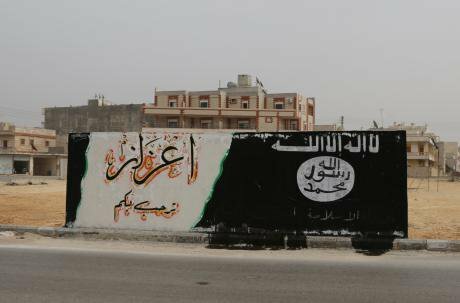 The sign upon entry to Azaz, Syria now bears the Islamic State of Iraq (ISI) logo. Demotix/Yasmin Al Tellaway. All rights reserved. In August of 2011 the new amir of ISI, Abu Baker al-Baghdadi, sent his Syrian deputy Abu Muhamad al-Golani–who were both detained sometime after 2005 in Camp Bucca, unbeknownst to each other–to Syria to establish what would later be known as Jabhat al-Nusra li Ahal-asham (the Support Front for the People of Sham). And Sham here does not mean Syria, as has been often wrongly translated. Rather it refers to the Levant, which formed a large part of Ottoman Empire. Its territory consisted of what is known today as the southern Turkish province of Hatay, Syria, Jordan, Lebanon, Palestine and Israel. 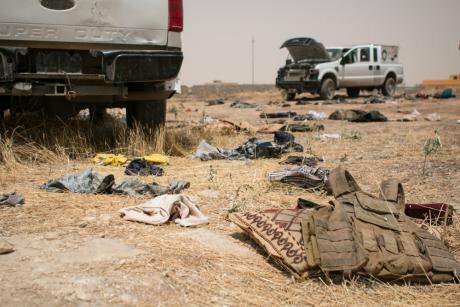 Abandoned Iraqi vehicles and personal belongings near Bartella, Iraqi Kurdistan, 20 km from Mosul. Demotix/Romina Peñate. All rights reserved. These relations were never fully eliminated even when the major Sunni tribes, former allies, turned against ISI in 2007. Although there were cooling-off periods on both sides at different times, there were always shifting, temporary, and partial revivals of these networks. These relations were revived in 2014 amongst increasing anger and protests within Sunni populations, especially in Anbar province on the Syrian border, against the Iraqi government who “squandered an opportunity” when they failed to demonstrate the required pragmatism. That is, when the Sunnis came together and waged a war against ISI, cleansing most of their areas of ISI and foreign-fighter jihadists–with no help from the government. With their acute sense of exclusion in the post-Saddam Iraq, Sunnis felt they had been betrayed by Nouri al-Maliki. This is Part 2 of a shorter version of a paper presented at a public lecture at The Leiden University Center for the Study of Islam and Society LUCIS on September 11- 2014. Read Part 1 here.